Dental emergencies can occur at unexpected times- in the middle of the night, during important occasions, or very early in the morning. Young children and senior citizens may also hurt themselves suddenly, and injuries like these need immediate medical attention. Sometimes, waiting for the next morning or until after the weekends are over is not the most feasible solution. 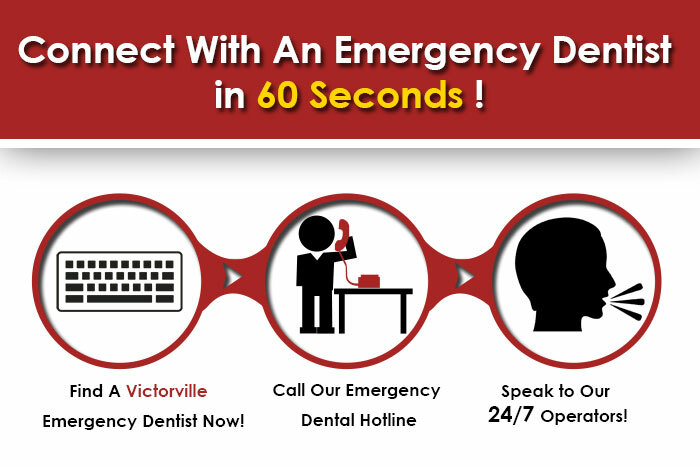 Hence, in any city, emergency dentists are of utmost importance, just like any other emergency service. Keeping some contact numbers handy for emergencies like this is a wise approach. Emergency dentists are open round the clock, which gives one the chance to visit the dentist at any time of the day for a chipped tooth or during the weekends, a time when normal clinics remain closed. One never knows when one might experience severe toothaches orbleeding gums. Therefore, dental issues must not be taken lightly. Those with busy work schedulescannot make time to visit the dentist during weekdays, hence, emergency dentists offer them a great opportunity so that they can visit during weekends for a checkup. Victorville, with a population of around 121,096, has many dental clinics that provide emergency dental services to its people. For those living in Victorville, California, knowing a few places to go in case of a sudden mishap can always prove handy. And so, we have provided you with a list of a few dental care clinics where you can go to in case of an emergency. It is important to note down a few of the names and the numbers of these places, as you never know when you might need them. Located at 15625 6th St.,Healthy Dental Care is managed by Dr. Ke Hu, who is very gentle in her operation on patients.Children are warmly welcome here, as the friendly staff handles them with utmost care. Services include root canal therapy, tooth cleaning, gum disease treatment, scaling and root planting, etc. Call them to book an appointment at 760-208-4858. Desert Sky Dental Group and Orthodontics is run by Dr. Rogelio Garcia and his staff. Their wide range of services include x-rays, veneers, sealants, fillings, crowns and bridges, etc. Make an appointment today at760-843-5824.They are located at 15667Roy Rogers DrSteA-101. Headed by Doctors Sergio Aguila and Armando Quintana DDS, Liberty Village Dental provides services, such as dental implants, veneers, whitening, digital x-rays, inlays, etc. They are located at13790Bear Valley Rd Suite: E5.Call them today if you want to know more or if you want to book an appointment at 760-955-2273. The staff at VIP Dental Care believe that behind every healthy smile is excellent care. They provide services, such as Implants, Grafts, Extractions, Dentures, and Whitening, etc. Located at 16200 Outer Bear Valley Rd., you can call them at 760-952-2102to book an appointment or if you want to know more.